I am thrilled to show with you these keto chocolate chip cookies. Keto cookies that are low carb, gluten-free and sugar-free are fantastic with a cup of coffee or tea. They are ready in less than 20 minutes which is excellent because you don’t have to spend hours cooking or giving in and eat high carb cookies. I’ve been keto for a while and actually never tried to make cookies in a low carb way. I tried this recipe without many expectations, and they are fantastic. To make it low carb I used almond flour, a sugar substitute that is low carb, high-quality butter, sugar-free chocolate chips and tons of passion. I love that one cookie is big enough to make you feel satisfied, but I always eat 2 of them. These cookies are just so good. Always use high-quality ingredients because they taste better and have more benefits. For example, for these sugar-free cookies, I used grass-fed butter because it contains 6 times more CLA than regular butter. CLA is a fatty acid found in meat and dairy products that help your body burn fat. 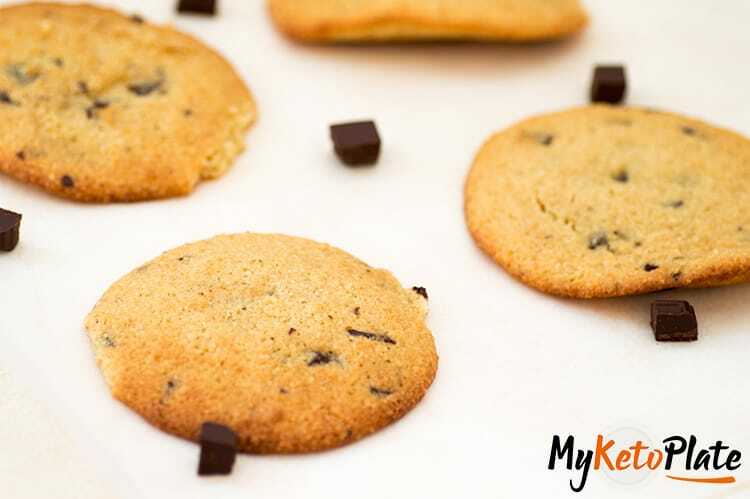 This is probably my 10th batch of keto cookies with chocolate chips and I tried a few variations of ingredients and this one (that I am sharing with you) turns perfect every time. I have a few friends that tried it and they are impressed too. It all starts with choosing the ingredients. Almond Flour – Choose a superfine flour. The ones that have little chunks of almond won’t work as well as fine almond flour. Grass-Fed Butter – It’s important to melt your butter but when mixing it with the other ingredients it shouldn’t be hot. Heat a saucepan and add the butter. When it starts to melt take it off the heat because it will continue to melt. This step is very important because using hot butter will make your dough too soft and you won’t be able to form the cookies into small balls that melt in the oven. Sugar-Free Chocolate Chips – Using them will make the recipe low in carbs and sugar. Xanthan Gum – This is a very important ingredient that’s often used in keto recipes as a substitute for gluten. It helps bind all the ingredients better. You only need a very small amount. The cookies are good without xanthan gum too but I prefer the version with xanthan gum. Sweetener – We will use a keto approved sweetener that doesn’t raise the blood sugar and keeps us in ketosis. Eggs – To bind all the ingredients together. 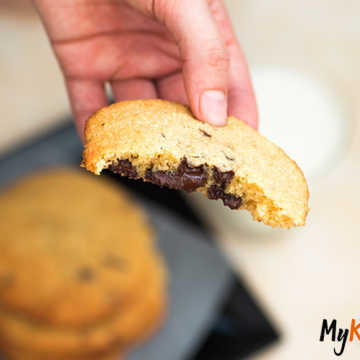 How to make keto chocolate chip cookies? Preheat the oven to 350F / 180 C.
Melt the butter in the microwave or a hot pot. If your butter is too hot, let it cool down. Using a blender or a hand mixer combine the butter with the sweetener. Blend for about 10-15 seconds until the sugar substitute dissolves. In a bowl combine the dry ingredients: almond flour, xanthan gum, baking powder. Combine the dry ingredients with the butter mixture. Add the chocolate chips. Using your hands form 10-12 balls and place them on a tray lined with parchment paper. Bake for 10 minutes or until they are beautiful and golden. Let the keto chocolate chip cookies cookies cool down and serve. How many carbs are in these keto cookies? I made 10 cookies out of the almond flour chocolate chip dough, so each one comes to only 3g net carbs. If you’re using an app to calculate the macros make sure you subtract both the fiber and sugar alcohol from the total carb content. 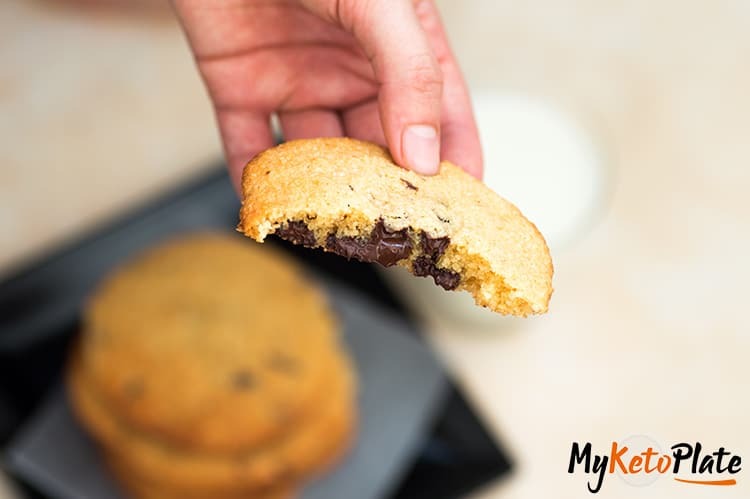 Keto Chocolate Chip Cookies is fast and easy to make gluten-free dessert. 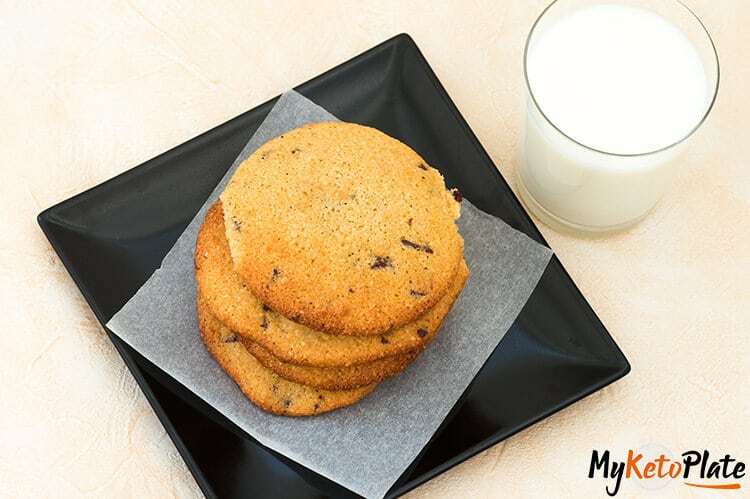 Each cookie is big enough to cure any sweet cravings. Delicious dark chocolate chips covered in an almond flour super soft cookie batter. Bake for 10 minutes or until they are beautiful and golden. Let the keto cookies cool down and serve.